My Noble ancestors come from my mom's side. Her mother was Laura Bell Noble (1903 - 1989). See was raised in the Cow Creek area of Owsley County, Kentucky. Eventually she moved to Ravenna in Estill county after she married my grandfather John Albert Roberts (1892 - 1976). I started working the Noble line in 2014. I found an interesting coincidence in the process. 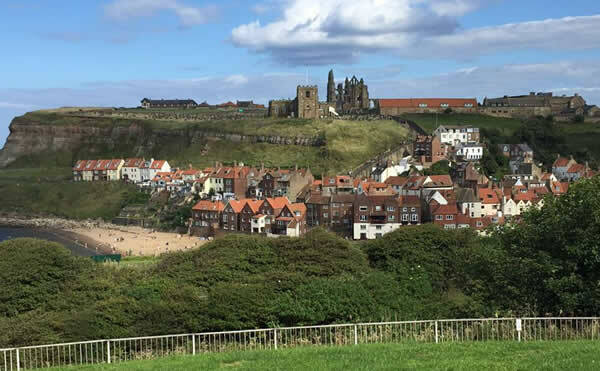 It seems Gawen Noble, my 10th great-grandfather, was born and resided for sometime in Whitby, Yorkshire, England. I first visited Whitby in 1992 and I now spend a few weeks there each summer. Now I have another connection. Whitby has a long history in the region. In this picture you can see the ruins of the very well known Whitby Abbey. Just to the left, and in front of the ruins, is St. Mary's which is very possibly where Gawen was christened.